away from the heat, blinding sunlight and dozens of chattering, laughing children. In the small, dim house, two chairs were the only visible furniture. The floor was dirt. The only light was from the doorway and a window. The widow, who was the homeowner, was beaming as, through a translator, as she thanked our fellow-traveler for funding the building of her house. Our interest in Burundi had started in 2007. That was a difficult year for me, a desert year, when everything I’d been doing ended or became difficult — our kids left for college, my work was not going well, our involvement in youth ministry had dwindled off. Seeking a new direction, the topic of extreme poverty and what it takes to change it had piqued my interest. I read “The End of Poverty”, “The Bottom Billion” and similar books. My husband and I talked about the amazing things successful entrepreneurs had done in philanthropy and what fun it would be to make a difference in a developing country. Burundi? Is that a country? In Asia maybe? Or Africa? After looking it up in an atlas, I went online and googled Burundi. I learned about its civil war and its extreme poverty. I googled aid organizations and searched for NGO’s active there. What I found was that they weren’t. Due to the violence and civil war, many NGO’s had left. After all, Africa held many places that were less risky and still needed aid. The world had forgotten about Burundi. Some months later, God put Burundi on my husband’s heart in a similar way. We wanted to get involved, but we didn’t know how. I spent hours googling Burundi and never came up with much. We had no idea what to do. We kept praying. In 2010, I read Job 29:13: I made the widow’s heart sing. I thought, how unusual! I could understand comforting the widow or helping the widow. But to make a widow’s heart sing! I thought there must be a lot of widows in Burundi, because of their civil war. I googled “Burundi widows” and right away the link came up for Sister Connection. We kept thinking about visiting Burundi. We love to travel, but Burundi was intimidating — the civil war and horror stories from elsewhere in Africa. We almost went in 2015, but political unrest made a trip inadvisable. Americans to the camps. We signed on. 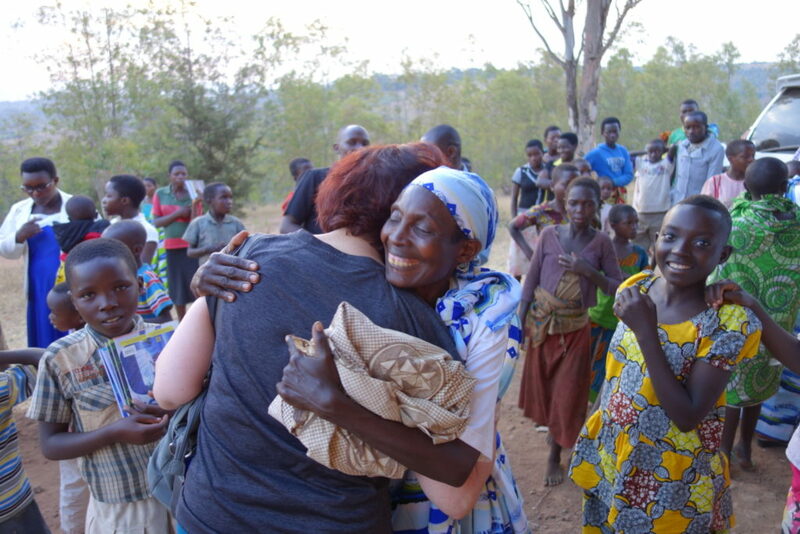 We came to Burundi and attended both the Widow’s Camp and the Youth Camp. Our team visited Mount Hope and Kibuye Hope Hospital. Yes, we experienced difficulties, like having no water the night we arrived, the van momentarily getting stuck in a burning, fly-infested city dump, and long detours from roads blocked off by intimidating soldiers holding machine guns and rocket-launchers. But we really had everything we needed and the trip was incredibly rich and rewarding. The widows’ offering at the end of the Widows Camp, which Amy Woods described in the website blog, was another experience that blew our minds and broke open our hearts. Watching these women, widows in one of the poorest countries in the world, joyfully bringing money and produce to give to “the poor” was unimaginable. We met with a group of “orphans” — teenagers and young adults whose mothers had been sponsored widows and then had died. These orphans have remained in their homes to raise their younger siblings. They told about the traumatizing deaths of parents and guardians. We listened to their anguished stories of having to leave school — the one possible route out of poverty — to care for their brothers and sisters. We hugged them and prayed for them, humbled by their courage and the burdens they already carry. We took selfies with them and became friends on Facebook. They call me Mama and say we are their family. We were so privileged to meet these widows and orphans who are so poor in the world’s goods and so rich in joy and in grace. We would not have found Sister Connection or made this trip unless God had led us and put on our hearts his passion for Burundi. “For we are his workmanship, created in Christ Jesus for good works which God has prepared beforehand that we should walk in them.” Ephesians 2:10.